The Day of Ashura is on the 10th day of Muharram in the Islamic calendar. It is the high point of the Remembrance of Muharram. Shi'a Muslims mourn for the martyrdom of Husayn ibn Ali, the grandson of Muhammad. He died at the Battle of Karbala on 10 Muharram in the year 61 AH (October 10, 680 AD). According to Sunni Muslim tradition, Muhammad fasted on this day and asked other people to fast. In some Shi'a regions of Muslim countries such as Afghanistan, Iran, Iraq, Turkey, Azerbaijan, Pakistan, Lebanon, and Bahrain, the Commemoration of Husayn ibn Ali has become a national holiday. Most ethnic and religious communities participate in it. Even in a mostly Hindu country like India, Ashura is a public holiday. 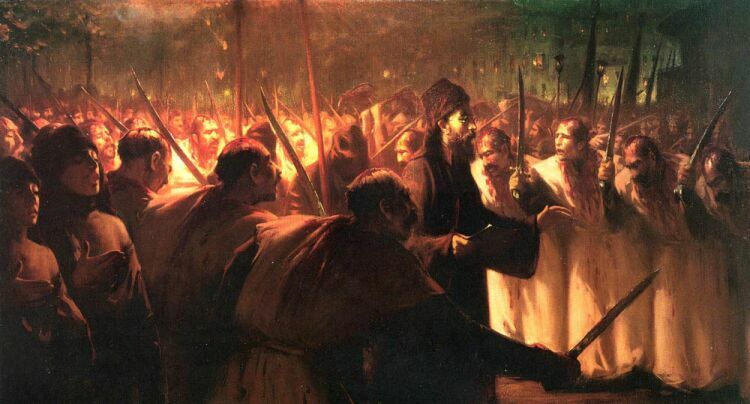 10th of the month of Muharrem: The Ashure Day - Huseyn bin Ali was murdered at Kerbela Remembrance by Jafaris, Qizilbash Alevi-Turks and Bektashis together in Ottoman Empire. Shi'a devotees congregate outside the Sydney Opera House in Australia to commemorate Husayn. Tabuiks being lowered into the sea in Pariaman, Indonesia, by Shia Muslims. Millions of Shia Muslims gather around the Husayn Mosque in Karbala after making the pilgrimage on foot during Arba'een, which is a Shia religious observation that occurs 40 days after the Day of Ashura. 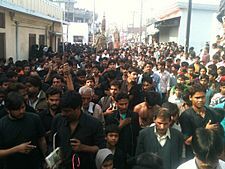 Indian Shia Muslims carry out a Ta'ziya procession on day of Ashura in Barabanki, India, January 2009. Shia Muslims carry out an Al'am procession on day of Ashura in Barabanki, India, January 2009. Day of Ashura Facts for Kids. Kiddle Encyclopedia.